Graded NM/MT 8 by SGC. A recently graded behemoth that has passed SGC's exceptionally difficult grading process and came out the other side with the exalting and impressive grade of NM/MT 8! "He is the star of stars, yet he can be one of the guys. He is constantly badgered for this or that, yet he always has time to oblige a youngster's autograph pad. While his famous slapshot is a terrifying 115 m.p.h. blur, the man behind it can be almost gentle — an excellent conversationalist, a jokester, just a nice fellow who carries his fame as aptly as he jettisons the puck." 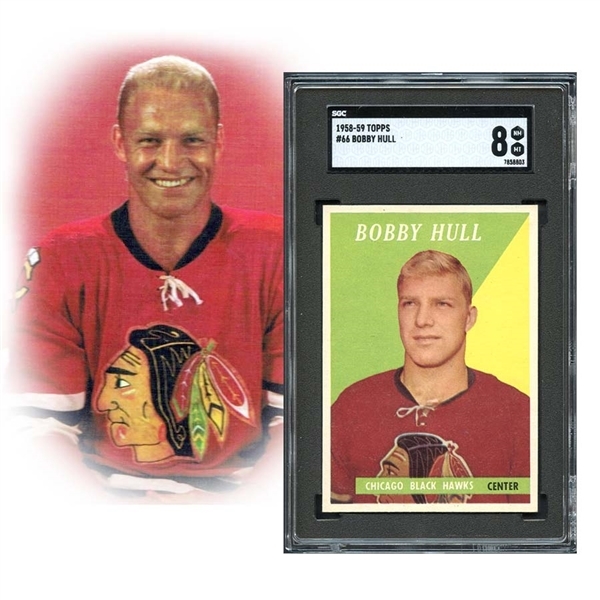 In 1966 Hull had become the first NHL player to score more than 50 goals in a season, surpassing the marks of Hall of Famers Maurice "Rocket" Richard and Bernie "Boom Boom" Geoffrion. Hull scored his 51st goal against the Rangers on March 12 at Chicago Stadium and received a seven-minute standing ovation. He would surpass 50 goals five times in his NHL career while winning the Art Ross Trophy as the league's top scorer three times. Hull received the Hart Trophy as league MVP twice and also helped the Hawks win the Stanley Cup in 1961. 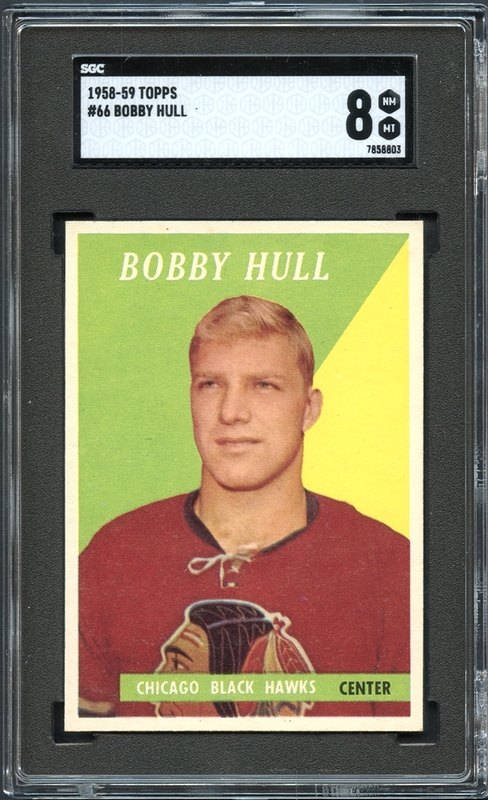 Offered is what is nearly without question one of if not the most difficult Hall Of Fame Hockey rookie card to acquire in NM/MT or better condition. 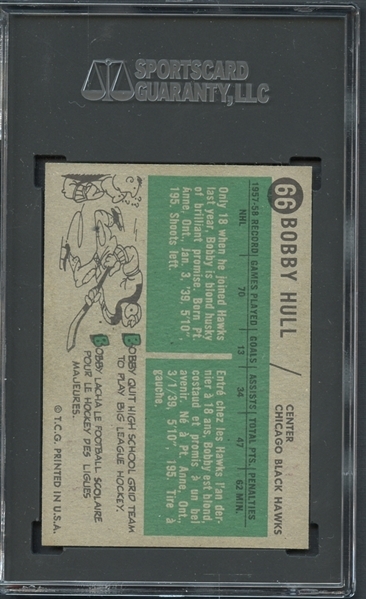 Notoriously difficult the featured card stands as 1 of just 2 copies to garner a NM/MT 8 grade of the 70 copies of this card that have been graded by the South Florida grading company. 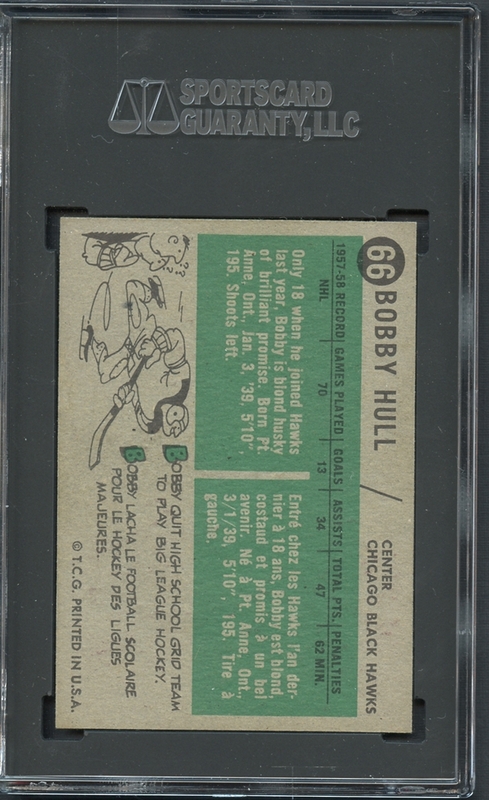 (and the only copy to be graded at that level in their recently introduced new black on black holder with the 1-10 grading designation) To further this point the PSA Population reports that just 6 copies of the 332 cards graded have been graded NM/MT 8 with just two copies graded higher. Spectacularly well centered which is absurdly uncommon, as well the card is void of the quite common print that plagues this issue. Each of the four corners stands at the verge of the next opined grade (we honestly thought this card would receive an 8.5 when we submitted this card) while the surface is awash in a satisfying layer of original gloss. The reverse is well printed with no staining apparent. 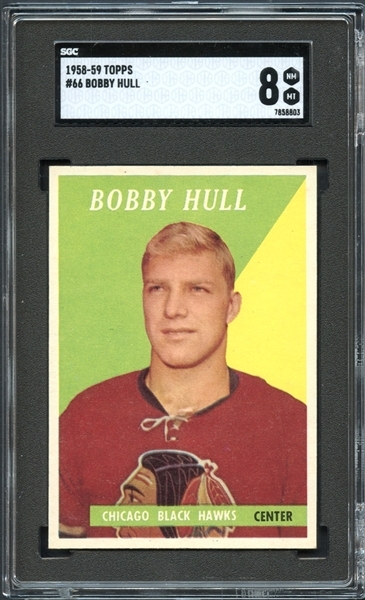 Without hesitation this is the finest Hull rookie card we have ever offered and also the finest we have encountered. The best!